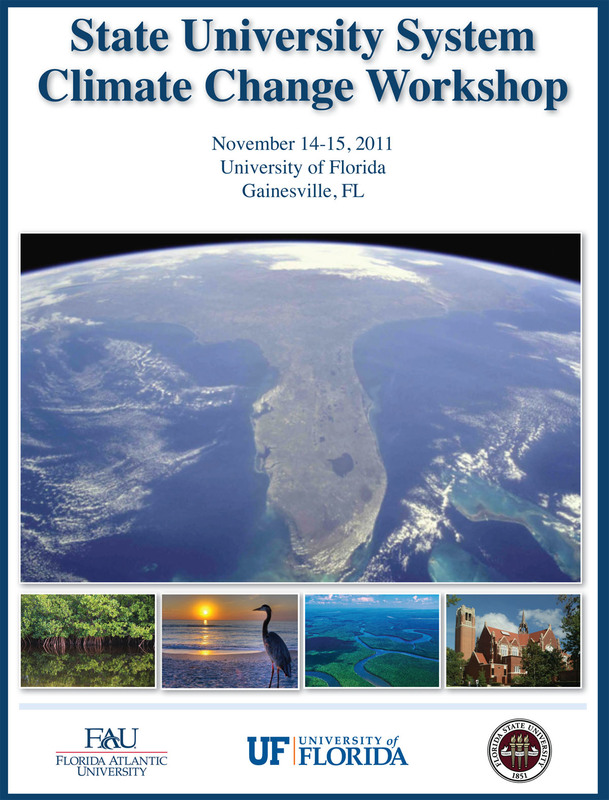 Last 14-15 November 2011 I had the opportunity of participating in the SUS CLIMATE CHANGE TASK FORCE WORKSHOP, organized and hosted by Florida Atlantic University [FAU], Florida State University [FSU], the University of Florida [UF], and The Florida Climate Institute. The event’s venue was Emerson Alumni Hall at UF in Gainesville. Speaking as someone who has organized, hosted, participated in and otherwise attended a number of events on the topic of climate change over the past fifteen years I can attest to the fact that at times, for some of us with an interest in this critical field, as we have continued to see many of the same participants and to debate the same issues, and listen to the same topics being presented, it may have appeared repetitive, as it happens when you are preaching to the choir, or as if we were long on questions and short on solutions. With regard to the above, I am pleased to report that this specific workshop was indeed refreshingly different. Although we took a look at the state of the science and other similarly traditional presentations, there was a much welcome emphasis on solutions, applications and on the business side of climate change. For example we heard from two non-academics, one the former mayor of the City of Gainesville who described for us how this Florida municipality and college town used the Climate Protection Agreement subscribed by the U.S. Conference of Mayors, representing 1054 municipalities from all 50 states plus DC and Puerto Rico, as a blue print to promote grants and incentives for business and government to become more energy-efficient and reduce its climate-damaging emissions. The net result of these initiatives by the City of Gainesville has been the stimulation of businesses, and the creation of jobs, in sectors related to building insulation, roofing systems, more efficient heating and air conditioning systems, manufacturing and installation of solar energy systems and the installation of a 100 MW plant to generate electricity from biomass to replace previously purchased electrical power generated by fossil fuel plants. While generating all of these economic activity, that has benefited so many, the city has reduced its carbon footprint, it has become much more energy efficient, and it is on target to have achieved a 7% reduction in total emissions below the 1990 levels by the end of 2012. This is an excellent case-study of a community that will achieve the targets set by the controversial Kyoto Protocol, while also stimulating its economy and generating jobs, contrary to the dire predictions of nay-sayers and those who deny global climate change on the basis of ideology rather than facts. Another speaker, this one from the private business sector, who addressed solutions and results rather than uncertainties and doomsday predictions, was the Director of Environmental Services Strategic Planning for Florida Power and Light. This speaker discussed major industry policies and program to address climate change, and in the process described specific programs by this giant utility company to increase the installed capacity for generating solar and wind energy, programs to increased zero-emission nuclear power generation, the hardening of existing infrastructure and of new buildings through programs of design criteria and retrofitting to incorporate adaptation to climate change impacts. Several other speakers and panelists continued to provide examples of actual solutions and success stories, painting a picture of a paradigm shift in the climate change arena. It is clear numerous communities, pushed by both public and private sector programs, have moved from dwelling on the uncertainties of research and the need for more research to identifying and implementing actual solutions. Rather than waiting for the federal government to act of for directives from other sources, these communities have taken a proactive approach to contributing to climate change adaptation and mitigation, while also showing this can be accomplished collaterally with beneficial economic results. I had the privilege of presenting a poster [Presentation1 ] regarding what I see as a critical knowledge gap in the criteria used for designing and building structures and houses in the coastal regions, which are vulnerable to hurricanes and storm surge that will become increasingly more damaging as these hazards are exacerbated by sea level rise driven by global warming. Following is a link to the abstract of my poster presentation [Poster Abstract] which was titled Storm Surge and Climate Change: The Forgotten Factor.